Lateral hip pain (pain on the outside of the hip) is one of the most common presentations we see at Fleurieu Physiotherapy. There are many different causes of lateral hip pain but one of the most common causes is Gluteus Medius Tendinopathy (GMT). GMT occurs when the glute med tendon becomes degenerative and cannot cope with loading like it once did. The gluteus medius tendon is a deep hip muscle that attaches into the lateral aspect of the hip and helps to stabilize the hip joint and control hip motion. Over time this tendon can degenerate resulting in pain and discomfort. GMT can also occur in conjunction with inflammation of the underlying bursa. A bursa is a fluid filled sac that helps the tendon glide over bone. When the gluteus medius tendon becomes degenerative it can cause friction of the underlying bursa, leading to irritation and inflammation. This then contributes to the pain experienced. A sudden increase in physical activity which overloads the tendon. Sitting with knees straight in front of hips, not with legs crossed! The length of time these decompressive strategies need to be followed will depend on the severity of the pain and the length of time the person has had symptoms for. The second stage of management includes the prescription of appropriate exercises to teach the tendon to cope with load more effectively. Physiotherapy treatment like massage, manual therapy at the hip joint and hydrotherapy can also be useful. For further information on physiotherapy management for GMT, give us a call or click the book online button to make an appointment. 11 Feb PD WARRIOR AT FLEURIEU PHYSIO! The team at Fleurieu Physio are very excited to be leading the way in SA for the management of Parkinson’s Disease, becoming the first PD Warrior licensed facility in South Australia. What is PD Warrior & how does it help? PD Warrior is a rehabilitation program that is designed for people with Parkinson’s Disease to help slow the progression of PD symptoms. PD Warrior uses specific, high intensity exercises to increase the brain’s natural ability to protect itself by creating more efficient neural pathways. These neural pathways are responsible for movement, so if the pathways are more efficient, it helps people with PD move more freely. Research shows that the PD Warrior program can not only improve movement in Parksinon’s Disease, it can also help to improve confidence and self-efficacy, both of which are essential components in supporting long-term management of a progressive disease. Traditional physiotherapy in Parkinson’s Disease has focused on teaching people movement strategies to compensate for their symptoms, rather than treating the primary source of the symptoms. PD Warrior uses specific exercises to train the brain to re-wire itself and protect remaining dopamine producing cells, thereby treating a primary cause of PD, not just the symptoms. Is PD Warrior for you? PD Warrior is a unique therapy approach that will assist people with mild to moderate Parkinson’s Disease. PD clients require a thorough initial physiotherapy consultation to help determine a specific exercise approach for you – this comes from an understanding of what type of Parkinson’s you have, what activities are a problem and what goals you (the client) has. Ideally PD Warrior is most effective if delivered in the early stages of the disease. Clients with mild – moderate PD can still experience benefits from the program, however, results may be slower. PD Warrior remains in direct contrast to traditional management and we know that taking medication is not enough. We want to see you early, work you hard and help you set up a plan to keep exercising for a long time to come. How do I get into the PD Warrior program? If you have Parkinson’s Disease (or know someone who does), you need to book in for an initial physiotherapy consultation with our PD Warrior trained Physiotherapist Stuart. Stuart will take a thorough subjective and objective assessment and together you will formulate a treatment management plan. You may then require several 1:1 physiotherapy sessions with Stuart so an appropriate exercise routine can be formulated. Once an exercise routine has been formed, Stuart will refer you into our PD Warrior Group. Our small group class runs for an hour each week and is a great opportunity to work hard, whilst also having a laugh and chat with other PD clients. For more information on our fee structure & PD Warrior timetable, please give us a call on 85287650 or send an email. 01 Jan Staying fit on the Fleurieu over the Festive Season! The Christmas holiday period is usually a time to overindulge and laze around. Long lunches and late nights are hallmarks of the summer holidays, however, there are many ways to stay active on the Fleurieu over the festive season. We’ve put together a list of 10 ways to keep active on the Fleurieu and avoid weight gain over the festive season. 7. Put up the beach tent and set up for the day at Horseshoe Bay. Swim out to the pontoon or across the Bay. 10.Give Park Run a go – a 5km loop every Saturday morning from Kent Reserve in Victor Harbor. As you can see there are plenty of ways to keep active on the Fleurieu over the festive season. Rather than using down time to walk to the fridge for another piece of Chrissy cake, get outdoors and start moving! Cheers to a happy and healthy year ahead! 10 Nov What is Wry Neck? Wry Neck is the term used to describe a stiff and painful neck, which is often associated with neck muscle spasm. Wry Neck is characterized by pain when turning the head, usually turning one way is more painful than the other way. Wry Neck can be acute, whereby you wake up with pain, or chronic whereby the pain and stiffness has been going on for a while. How common is Wry Neck? Wry Neck is very common. It can happen to anyone at any age and can be quite disabling. Acute Wry Neck is more common in younger people while chronic Wry Neck occurs more regularly in older adults. Luckily Wry Neck treatment can be very successful. The most common cause of acute Wry Neck is a stiff and locked facet joint. Facet joints are located in the back of the spine and are the joints where the vertebrae sit on top of each other. Facet joints allow smooth movement of the neck and enable the vertebrae to glide over each other as you turn your head. Sometimes these facet joints can become stiff and stuck, meaning they do not glide properly as you move your neck, resulting in pain and stiffness. Several things can cause these facet joints to become stiff and stuck, including sleeping in a funny position or moving your head quickly. Chronic Wry Neck can be caused from arthritis in the neck joints which stop the facet joints gliding properly. Gradual onset Wry Neck occurs over a period of time and can be described as a slow increase in pain when rotating the head. Acute Wry Neck usually responds very well to physiotherapy treatment. Physiotherapy treatment focuses on unlocking the stiff facet joints and helping them glide comfortably again. Chronic Wry Neck can take a little longer to treat but good results can still be achieved. Physiotherapy treatment may also include massage of tight neck muscles, education regarding neck posture and function, as well as addressing any contributing factors such as what pillow you’re using. If you have a stiff and painful neck, it’s best to make an appointment with your Fleurieu Physiotherapy & Wellness physiotherapist for a thorough assessment and treatment plan. Simply click the ‘book-online’ tab to make a booking. Difficulty walking, characterized by a slow, shuffly gait with minimal push off and heel strike. While there is no current cure for PD, several treatment options do exist. Fleurieu Physiotherapy & Wellness are now offering a fantastic program called ‘PD Warrior’ which is an exercise philosophy designed to help slow down the symptoms of PD. PD Warrior uses specific, high intensity exercises to target symptoms of PD. PD Warrior is different from working out in the gym or going for a walk as these generic exercises do not give the body the opportunity to drive the brains natural ability to re-wire itself. PD Warrior incorporates the most current evidence into its program to ensure that clients get success. PD Warrior classes at Fleurieu Physiotherapy & Wellness are energetic, motivating and a bit of fun! Our physiotherapist Stuart is excited to help clients with PD live their best life possible. To join our PD Warrior program, you require an initial physiotherapy assessment followed by a couple of 1:1 sessions with Stuart where he will teach you the basics of the PD Warrior program. Stuart will then transition you into the group class. For further information on PD Warrior at Fleurieu Physiotherapy & Wellness, call us on 8528 7650 or click the ‘book online’ button to make an initial appointment. We can’t wait to see you soon! Certain exercises can help to speed up the recovery process of Carpel Tunnel Syndrome. It’s a good idea to incorporate exercises into your daily routine to reduce the chance of CTS reoccurring. In this weeks blog post we show you some simple exercises you can do to help with CTS. 2.Wrist range of motion exercises. These will help to reduce stiffness in the wrist joint and tension of surrounding muscles, allowing the tendons and median nerve to glide better. Aim to repeat each exercise 5-10times 2-3times per day. 3.Median nerve glides. These will get the median nerve moving in the carpel tunnel more comfortably, thereby reducing irritation and swelling of the nerve. It is important that this exercise is done pain free so it doesn’t ‘set the nerve off’. We suggest slowly building up the number of repetitions and sets you do, as guided by your physiotherapist. *Note: Fleurieu Physiotherapy & Wellness always recommend having a physiotherapy assessment done prior to commencing any exercises, to ensure the exercises are appropriate for your symptoms. For more information or to make a booking, please phone 8528 7650.
carpel tunnel. This increase in fluid then irritates and compresses the median nerve. 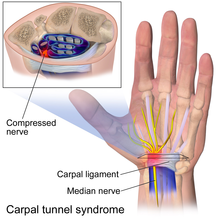 leading to compression of the median nerve. shown to increase the likelihood of developing CTS. The most common symptom of CTS is pins and needles in the thumb, index and middle finger. also be a loss of grip strength and wasting of the muscles at the base of the thumb. CTS is bilateral meaning it affects both hands – typically one hand is worse than the other. accumulation of fluid / swelling in the area. How do I know if I have CTS? median nerve may also be done in order to diagnose CTS. What are the treatment options for CTS? exercises – we will go through these in more detail in next weeks blog post! pressure on the median nerve. your GP first. For further information on physiotherapy treatment for CTS, stay tuned for next weeks blog post. 18 Sep Bursitis – symptoms, causes & treatment options! Bursitis is the term given to describe inflammation of a bursa. A bursa is a small fluid filled sac that sits between bone and soft tissues (muscles, tendons etc) to act as a cushion, reducing friction and assisting in joint movement. There are many bursas in the joints in the body; when you overuse or injure a joint, the nearby bursa can become irritated and inflamed. When this happens the bursa fills with excess fluid, resulting in pain and altered movement. Bursitis is diagnosed through a thorough subjective and objective assessment process, whereby the patient’s signs and symptoms are considered to determine if bursitis is the cause of their problem. Objective tests used to diagnose bursitis may include ultrasound of the painful area, X-ray of the affected joint, palpation, muscle strength testing and assessing joint range of motion. Fleurieu Physiotherapy & Wellness physiotherapists see many patients present with bursitis, with shoulder and hip bursitis being the most common presentations. Treatment will depend on several factors including the severity of the patients pain, the location of their pain and the patients medical history. Physiotherapy treatment aims to relieve symptoms as much as possible, while also addressing the cause of the problem to reduce the chance of it re-occurring. In severe causes of bursitis, treatment options may also include taking anti-inflammatory medications and/or a corticosteroid injection into the affected bursa. In such cases, prescription of medication and referral for an injection only ever occurs under the guidance of the patient’s doctor. If you have symptoms that could be related to bursitis, book in to see one of Fleurieu Physiotherapy & Wellness’ physiotherapists. We can help reduce your pain and get you moving more comfortably. The World Health Organisation estimates that 80-90% of people suffer from acute low back pain (ALBP) at some point in their lives. Normally low back pain is short term with most people making a good recovery within 6-8 weeks. ALBP is classified as low back pain that has a duration of 1-3 weeks. Active management for ALBP is very important and can assist you in making a speedy recovery. The mechanism of injury for ALBP can vary vastly. The back is made up of the spinal cord and its branches called nerve roots, which are protected by small bones called vertebrae. In between each vertebrae are gelatinous discs. The muscles and ligaments surrounding the vertebrae provide most of the support for the spine. All of these structures have to work together to allow movement of the spine. Sometimes repetitive movement, quick unguarded movement or heaving lifting can cause the disc between the vertebrae to protrude leading to an inflammatory response and pain. Other times the cause of ALBP is unknown. Many patients are diagnosed with ‘non-specific low back pain’ which means that no definite structure can be identified as the cause of the pain. It is always a good idea to check with your GP to see if further investigation of your ALBP is required. Provided any serious cause for your ALBP has been excluded by your doctor, there are several ways you can actively manage ALBP. The best thing you can do for ALBP is to stay gently active. Don’t be afraid that you will damage your back if you move; the spine is quite an amazing structure and is quite durable. In fact, research has shown that too much rest can slow your recovery. Try to avoid high impact activities but start light activities as soon as you can. Once your symptoms start to settle consider starting some gentle stretching and exercises to aid your recovery. It’s important to remember though that every person is different and what works for one person may not necessarily work for you. It’s also recommended that you assessed by your Fleurieu Physiotherapy & Wellness physiotherapist to make sure the exercises you’re doing are right for you. The exercises below are meant just as a guide; if your pain gets worse with any of the exercises or if you are unsure of the correct technique, stop them. Lie on your back with knees bent and feet on the floor. Hold one knee up at your chest for 15-20 seconds then lower and swap sides. Do 5 repetitions both sides, 2-3 times / day. Lie on your back with knees bent and feet on the floor. Think about tipping your pelvis back so your low back flattens into the floor. Then think about tipping your pelvis forwards so your low back arches away from the floor. Do 5-10 repetitions, 2-3 times / day. Lie on your back with knees bent and feet on the floor. Rock your knees from side to side slowly trying not to lift your buttock off the ground. Do 5-10 repetitions, 2-3 times / day. 06 Aug The Truth about Tennis Elbow! Tennis elbow, or lateral elbow epicondylitis, is a common condition we see and treat at Fleurieu Physiotherapy & Wellness. Tennis elbow is characterized by pain over the outside of the elbow, where your forearm muscles meet your elbow. Unaccustomed excessive hand use i.e. packing boxes when moving house, painting a fence. Excessive gripping or wringing activities. Tennis elbow can either be acute or chronic. Acute Tennis Elbow usually happens after an unaccustomed activity (like those above) where more force is applied to the forearm / elbow region than the normal healthy tissues can handle. Chronic tennis elbow is associated with degenerative changes in the muscle tissues where the tendon attaches to the elbow. In chronic tennis elbow the unhealthy tissues cannot deal with the same amount of load and repetition that normal healthy tissues can. Chronic tennis elbow is diagnosed as having lasted longer than 3 months. Physiotherapy has been shown to be an effective treatment in the management of tennis elbow. At Fleurieu Physiotherapy & Wellness your physiotherapist will undertake a thorough initial assessment that will help guide your treatment. Your physiotherapist will discuss with you the best treatment plan for you, depending on the severity and duration of your symptoms. Results are usually measured thorough subjective tests like your feedback and pain rating, as well as objective tests like grip strength testing. Prescription of appropriate home exercises. At Fleurieu Physiotherapy & Wellness all our physiotherapist are skilled treating tennis elbow so call us today or click the tab to make an appointment on-line.